HAVANA, Apr 8 2015 (IPS) - U.S. President Barack Obama was only four days old when Comandante Ernesto “Che” Guevara publicly castigated the United States’ policy of hostility toward Cuba at an inter-American summit, reiterated then Prime Minister Fidel Castro’s willingness to resolve differences through dialogue on an equal footing, and held secret conversations with a Washington envoy. More than half a century later, the U.S. president accepted the challenge of pursuing rapprochement with the Caribbean island country, overcoming conflicts, mutual resentment and tensions, and initiating the still precarious process of normalising bilateral relations. On Apr. 10 and 11 he will come face to face with Cuban President Raúl Castro at the Seventh Summit of the Americas in Panama City. 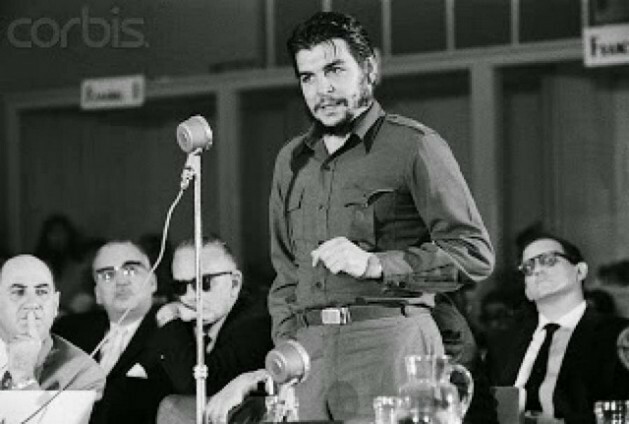 Guevara addressed the meeting of the Inter-American Economic and Social Council of the Organisation of American States (OAS) on Aug. 8, 1961, on behalf of the Cuban government of Fidel Castro, his leader and comrade-in-arms in the guerrilla revolt that deposed Cuban dictator Fulgencio Batista on Jan. 1, 1959. The summit meeting, held in the Uruguayan resort city of Punta del Este, was the last time Cuba participated in an inter-American forum, as the island nation was suspended from the OAS in January 1962, a measure that was officially lifted in June 2009. The central theme for the Seventh Summit will be “Prosperity with Equity: The Challenge of Cooperation in the Americas,” a goal which will require more than documents and formal statements for the region to achieve. According to the Economic Commission for Latin America and the Caribbean (ECLAC) Social Panorama report, the number of poor has risen for the first time in a decade. Between 2013 and 2014, three million Latin Americans fell into poverty, and it is feared that an additional 1.5 million people will be living below the poverty line by the end of 2015. At the Punta del Este conference the United States formally established the Alliance for Progress, launched by U.S. President John Kennedy (1961-1963) months earlier to counteract the influence of the Cuban Revolution in the region, after his government’s frustrated attempt to invade the island in April 1961. Behind the scenes of that conference the Argentine-born Guevara held a confidential meeting in Montevideo on Aug. 17 with Richard Goodwin, Kennedy’s special counsel for Latin American affairs, regarded by Cuban media as the first high level contact between authorities of both countries since bilateral relations had been broken off in January 1961. Since then there have been numerous unsuccessful attempts to secure closer ties, until after Fidel Castro’s retirement in 2006, his brother and successor Raúl together with Obama surprised the world on Dec. 17, 2014 with their announcement of the joint decision to restore diplomatic relations. Hence a lot of attention in the run-up to the Seventh Summit of the Americas is being focused on the two heads of state. It will be Obama’s third attendance at a Summit of the Americas, while Cuba has been excluded until now. Cuba’s presence at this Summit is the result of a diplomatic strategy that led to unanimous support from countries of the region for its reinstatement, and that brought about the thaw with the United States. Cuban political scientist and essayist Carlos Alzugaray regards the growing autonomy of the region as a factor in the process. “It could be said that the United States has lost the initiative and its room for manoeuvre” south of the Rio Bravo or Rio Grande, he told IPS. After the first Summit of the Americas which took place in 1994 in the U.S. city of Miami, successive meetings revealed that Latin America was increasingly unwilling to accept U.S. dominance. This came to a head with the proposed Free Trade Area of the Americas (FTAA), a star concept at early summits but which fell out of favour in just over a decade. As a regional counter-proposal, in December 2004 Chávez and Fidel Castro launched what is now known as the Bolivarian Alliance for the Peoples of Our America (ALBA), made up of Venezuela, Cuba, Nicaragua, Bolivia, Ecuador, Dominica, Antigua and Barbuda, Saint Lucia, Grenada and Saint Kitts and Nevis. Three years later, the Union of South American Nations (UNASUR) was founded in order to encourage integration, social and human development, equity and inclusion in the region. Its members are Argentina, Bolivia, Brazil, Chile, Colombia, Ecuador, Guyana, Paraguay, Peru, Suriname, Uruguay and Venezuela. All the countries of the Americas except the United States and Canada came together in 2011 to form the Community of Latin American and Caribbean States (CELAC). This forum reinstated Cuba as a full member of the regional concert of nations, in the absence of Canada and the United States. But the Panama Summit, convened formally to satisfy the region’s demand to end Cuba’s ostracism from the bloc of the 35 independent states in the Americas, and to take a significant step toward normalisation of relations between Havana and Washington, may need to shift its attention to the crisis between the United States and Venezuela. Obama issued an executive order on Mar. 9 declaring that the situation in Venezuela, governed by socialist President Nicolás Maduro, is a “threat to the national security of the United States,” and he imposed several of the country’s senior officials. The measure met with the disapproval of the majority of Latin American countries. “No country has the right to judge the conduct of another and even less to impose sanctions and penalties on their own,” said UNASUR Secretary General Ernesto Samper, a former president of Colombia. In his view, unilateralism will prevent Washington from maintaining good relations with Latin America. “Under these circumstances, it will be very difficult for the United States to develop a strategy in the region that takes into account Latin American and Caribbean interests and allows for natural adaptation to change,” said Alzugaray. In his opinion, Obama has made “a serious mistake” in the run-up to a meeting that was supposed to celebrate hemispheric reunion. “The region will overwhelmingly support Cuba and Venezuela,” Alzugaray predicted.